Make the crêpes Heat a 9-inch nonstick skillet over moderately high heat. Brush the skillet lightly with vegetable oil, then add 1/3 cup of the eggs, swirling the pan to coat evenly. Cook until light brown on the bottom and just set, 1 to 2 minutes. Transfer the crêpe to a plate and cover loosely to keep warm. Repeat with the remaining eggs, stacking the crêpes as they’re done, to form 6 total. Make the filling In a small bowl, cover the dried shiitake mushrooms with boiling water and let stand until softened, about 20 minutes. Drain well and thinly slice. In a small bowl, whisk the soy sauce with 1 tablespoon of the cornstarch, the wine, sesame oil, and 1/4 teaspoon of the sugar. In a large skillet, heat the 2 tablespoons of vegetable oil until shimmering. Add the shiitakes, bamboo shoots, button mushrooms, baby corn, celery, water chestnuts, carrot, and garlic. Stir-fry over moderately high heat until the vegetables are softened, about 8 minutes. Add the soy sauce mixture and cook until thickened, about 2 minutes. Scrape into a medium bowl, stir in the chicken, and season with salt and white pepper. Let cool completely, then refrigerate until chilled, about 30 minutes. In a small bowl, whisk the remaining 1 tablespoon of cornstarch with 1 tablespoon of water. Place 1 crêpe on a work surface and spoon one-sixth of the filling onto one end. Roll up the crêpe into a neat bundle, folding in the sides. Dab the edges of the egg roll with cornstarch slurry to seal. Repeat with the remaining crêpes and filling to form 6 egg rolls. In a medium bowl, whisk flour and remaining 1 teaspoon of sugar with 1 cup of water until smooth. In a large saucepan, heat 3 inches of vegetable oil to 350°. 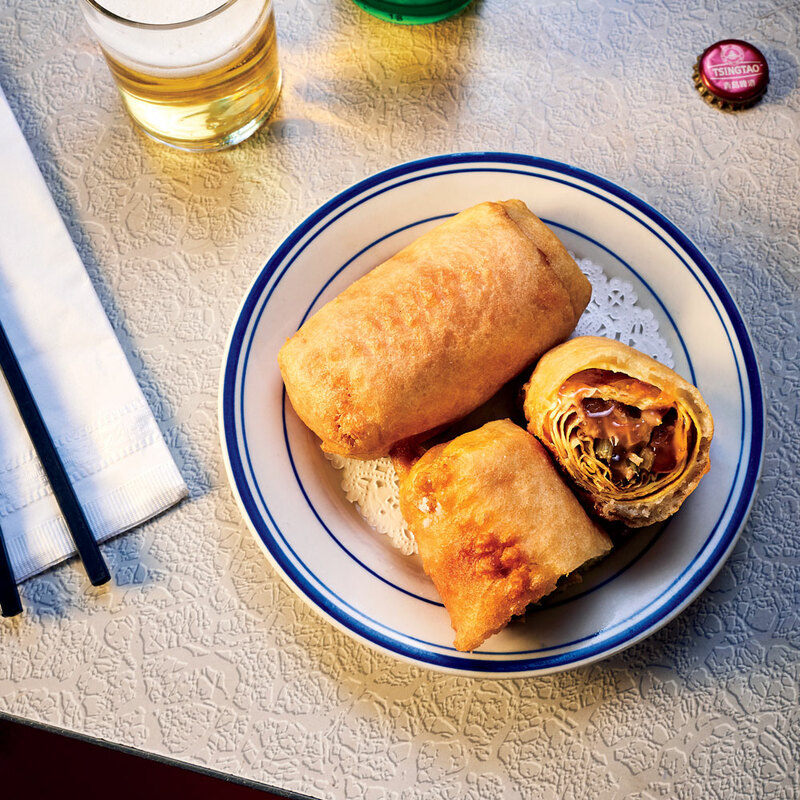 Fry egg rolls in two batches: Coat egg rolls in batter one at a time. Using tongs, carefully lower into the hot oil. Fry until lightly browned and crisp, 3 to 5 minutes. Transfer to paper towels to drain. Repeat with remaining egg rolls and batter. Serve immediately. The filling can be prepared through Step 3 and chilled for up to 4 hours.